One of the things that make us, as individuals, so unique is our working style. Everyone has their own habits, rituals, preferences and processes that they turn to for productivity. Some people love working in teams, while others prefer to fly solo. And, while there is no right or wrong answer, there are ways to increase your productivity based on your unique personality. One way to look at this topic is seeing where you fall on the extrovert – introvert scale. To get started, let’s take a quick look at how these personality types are defined. While there are some common personality traits amongst introverts, there are also varying levels / degrees. Social introverts typically prefer to be alone or only to be social within small groups versus large ones, but aren’t shy or anxious around others. Thinking introverts tend not to avoid large social gatherings, but they do get caught up in their own thoughts often and are typically very self-reflective. Anxious introverts like being alone because they may feel anxious or awkward around others. They also may spend time thinking about what could go wrong. Restrained introverts do a lot of thinking before actually doing. This results in moving at a slower pace to ensure everything they do is intentional. Focus on your environment. Sometimes an open floor plan can feel overwhelming. If you’re feeling overwhelmed, talk with your manager about creating specific work areas for quiet, concentration time. If group meetings or large team projects leave you feeling overwhelmed, ask key members of the team for some one-on-one time. This can help you overcome any feelings are disconnection or anxiety while still accomplishing your tasks. Take time to prep. If you want your voice to be heard in a meeting, you can make this a reality by reviewing what will be discussed in a meeting and mentally planning on when you speak up. It’s a much better approach than waiting for the ‘right’ time, which may never come if you’re feeling unprepared. Think in terms of one step at a time. If you have 20 things on your plate, this can feel like you have a mountain to climb. Talk with your manager about your work style to see if you can dig deep into one or two things at a time. Affiliative extroverts love social interactions. They can be warm, friendly and often thrive in new situations. Breaking the ice in new relationships may come easy to them. Often, they have a large group of close friends. Agentic extroverts tend to be seen as go-getters and embody assertive and persistent personality traits. They like being the center of attention and like leadership roles. Don’t be afraid to be busy. Typically extroverts don’t get stressed out by a lot of tasks. If you fall into this group, use it to your advantage, but don’t go overboard; it can often result in burnout. Get inspired. If your office is completely quiet and still, it can be counterproductive to your personality type. You might need some external energy to feel motivated, so take a few minutes to get outside, feel the air and hear the noises. This can be a huge help to get creative juices flowing. Take time to reflect. If you’re moving non-stop, you probably aren’t taking time to think about your day. Block out 10-15 minutes at the end of the day to be still. This can help in seeing what worked out well during the day, and what didn’t. Schedule time to be social. Setting up lunches or happy hours with co-workers will give you an outlet for socializing that doesn’t intrude in your normal workday. If you work remote or with a small team, look into co-working spaces. They typically offer a lot of social activities. According to a University of Maryland study, Ambiverts make up 68% of the population. 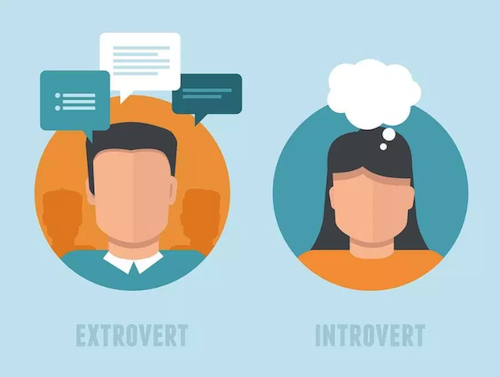 These personalities fall right in the middle of the introvert and extrovert scale. Work to find balance. You may find that some of the introvert productivity tips resonate more with you than the extrovert tips, so roll with it. But, don’t limit yourself. Embrace the flexibility to see what works best over a few weeks. Stay fluid. One day, you might feel more productive with extrovert tips, but the next they might feel all wrong. Don’t let this scare you. Take note of your mood and feelings and don’t be afraid to dip your fit in both camps. While these tips can be helpful, one key thing to remember is don’t ever get too comfortable. If you see yourself as an introvert, don’t be afraid to explore some of the extrovert tips and vice versa. This approach might be uncomfortable at first, but will be valuable in helping you be a more well-rounded individual. Because at the end of the day, stepping outside your comfort zone is where growth and positive change takes place! We hope that these tips help you and your journey to greater productivity!